Hello my name is Lorna and I live in Glasgow. I started cardmaking about five years ago as a way of making friends, as my husband works overseas for four weeks at a time. This card was made for my cousin's daughter's eleventh birthday and I made it by following Christina's Shaker Card Tutorial and I used the same dies as in the tutorial. I started off with an 8" square card blank and some pretty papers, all from my stash. The sitting girl stamp is from Molly Blooms and the flowers/leaves are all from Wild Orchid Crafts. This was my very first attempt at a shaker card and by following the tutorial I had success first time which made me feel pretty pleased. My cousin and her daughter definitely seemed to be impressed with my card and I think Megan liked the fact that it had the shaker box element to it. I, of course, was happy to get such a positive response for my efforts. I only make cards for family and friends and I am part of a small group who meet up every couple of weeks to share ideas. Thank you for showing my card. I am always so very pleased to hear that my tutorials are easy to follow and this card proves just what can be achieved even if you are new to some of the ideas. 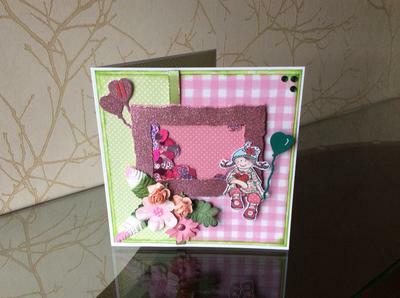 Lorna this is lovely and you should be very proud of your first shaker card. I like the image sitting on the frame and the colors you have used and I am not surprised that it was well received. I hope you will go on and try some of the other ideas that are on the website and add them to our page too for all your friends to see. What a beautiful card. More of a Keepsake, that I'm sure your cousin's daughter will treasure. Also lovely to see the word Glasgow as I was born and brought up there and have a special affinity with the Dear Green Place. You made my day. I do hope we will see many more of your lovely creations. Well this card sure is sitting pretty - a lovely card that can be changed by adding different embellishments and colour schemes. Lovely.